This oped originally appeared on the Huffington Post. A remark made last week by Sudan's ambassador to the United Nations is renewing suspicions that the Lord's Resistance Army is hiding in Sudan and receiving support from the Sudanese government again. Highly credible reports received by the Enough Project several days ago indicate that Kony was recently in Darfur and may still be there. Such a development would not only generate enormous obstacles for ending the LRA but could also reignite war between the two Sudans. Ambassador Daffa-Alla Elhag Ali Osman's comments came in the context of discussions about a new mandate for the hybrid U.N. and African Union mission in Darfur known as UNAMID. With the mandate set to expire on July 31, a new mandate that was under consideration would task UNAMID with monitoring possible LRA presence in Darfur. The final mandate, approved on July 31 by the U.N. Security Council, "encourages UNAMID, within existing capacities and consistent with its mandate, to co-operate and share information" about the LRA. Including this issue is going to be an impediment and cause of refusal, which may affect our cooperation with UNAMID and its actions in Darfur. If we truly wish to establish peace, stability and security then let us discard this issue far away from Darfur and UNAMID… Those who support that position will be responsible for the consequences stemming there from. At the same time, the Sudanese ambassador reportedly stated that Sudan condemns the LRA and is committed to cooperating with the international community to end the group. If that is so, what is Khartoum afraid of? Reports suggest that China and Russia were trying to block the proposed mandate. The ambassador's statement raises three grave concerns. The first is that it would create a major setback for efforts to end the LRA, including the new U.N. regional strategy on the LRA and the U.S. military advisors who are working with governments in the region. If any of the LRA's sub-groups, including the one led personally by Joseph Kony, are in Sudan and receiving support and safe haven from the Sudanese government, the LRA will emerge decidedly stronger—at a moment when it boasts only approximately 250 fighters. That the LRA could be in Sudan supplied by Khartoum is well within the realm of possibility. 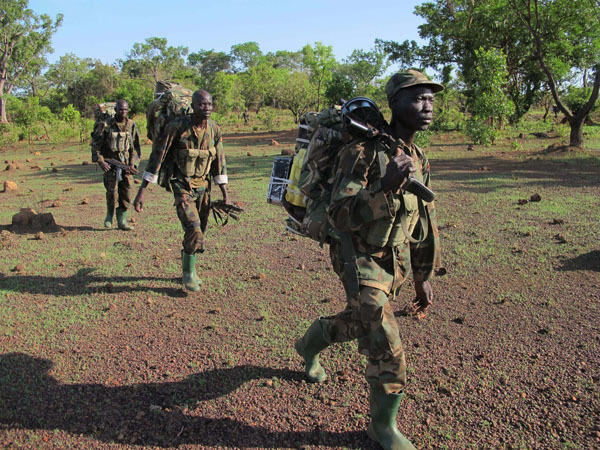 The Sudanese government began supplying the LRA in 1994, providing weapons, ammunition, training, and military bases, while allegedly halting its assistance in 2005. Kony ordered his commanders to move to Darfur in 2009, and LRA forces met with Sudan's army the following year. More recently, allegations by Ugandan government officials and a Darfuri rebel group in April 2012 indicated that the LRA could again be in Darfur and assisted by Khartoum. That same month, a former LRA abductee who was recently repatriated asserted that Kony was in South Darfur. Second, the presence of the LRA in Sudan would pose an enormous obstacle to the already hamstrung military operations against the LRA and the nascent A.U. Regional Task Force that plans to disband the group. If Khartoum will not let UNAMID monitor potential LRA activity in Darfur, it is not going to allow the Ugandan army—the only army conducting offensive operations against the LRA and its long-time nemesis—to pursue the group there. Third, the LRA could become a larger threat to regional stability. Khartoum could employ the LRA again to fight a proxy war against South Sudan, which just celebrated its first year of independence from Sudan. The international community, particularly the United States, has a critical role to play in ensuring that efforts to end the LRA do not move in the direction they seem to be heading: failure. Chief among the challenges plaguing these efforts is the lack of troops that are capable of and committed to apprehending the top LRA commanders wanted by the International Criminal Court and protecting civilians. With the transfer of the U.S.-trained 391st battalion of the Congolese army last month from LRA-affected areas to Goma to battle the M23 rebellion, there are now only about 1,000 troops pursuing the LRA in a 115,000 square-mile area, roughly the size of Arizona. Other challenges include the lack of access for the Ugandan army to pursue the LRA in Congo and parts of the Central African Republic, insufficient intelligence and logistical capabilities, the lack of a clear strategy for protecting civilians, and inadequate efforts to encourage LRA commanders and fighters to leave the group. One key way the U.N. and the A.U. can address these obstacles is to convene a side meeting about the LRA during the opening of the U.N. General Assembly in September. It is critical that President Obama attend this meeting. Secretary Clinton should also raise these issues during her meeting with Ugandan President Yoweri Museveni later this week.